The 12 m radio telescope APEX in Chile has been outfitted with special equipment including broad bandwidth recorders and a stable hydrogen maser clock for performing joint interferometric observations with other telescopes at wavelengths as short as 1.3 mm and the goal to obtain the ultimate picture of the black hole shadow. 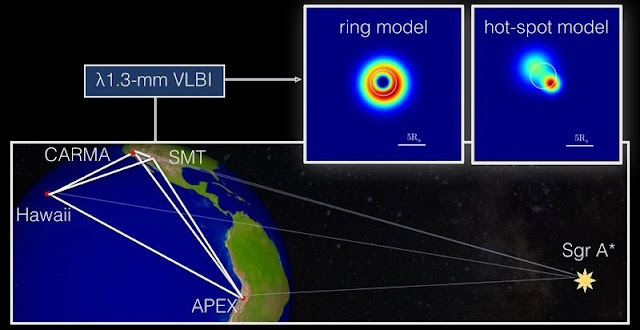 The addition of APEX to the so-called Event Horizon Telescope (EHT), which until recently consisted of antennas only in the northern hemisphere, reveals new and unprecedented details in the structure of Sgr A* at the center of the Milky Way. The increased angular resolution provided by the APEX telescope now reveals details in the asymmetric and not point-like source structure, which are as small as 36 million km. This corresponds to dimensions that are only 3 times larger than the hypothetical size of the black hole (3 Schwarzschild This corresponds to dimensions that are only 3 times larger than the hypothetical size of the black hole (3 Schwarzschild radii). Astronomers are hunting for the ultimate proof of Einstein’s theory of general relativity, which is to obtain a direct image of the shadow of a black hole. This is possible by combining radio telescopes spread over the globe using a technique which is called Very Long Baseline Interferometry (VLBI). The participating telescopes are located at high altitudes to minimize the disturbance from the atmosphere and on remote sites with clear skies, allowing to observe the compact radio source Sagittarius A* (Sgr A*) at the center of the Milky Way.